From what I can tell the original Roper Plates are no longer available. The last batch that was offered via Scud appear to be sold out. At this point it looks like the Gutsibits version is the only option available. What are the advantages and disadvantages of the the aluminum vs stainless steel versions? Why wasn't stainless steel used on the original version? Was it because at the time CNC aluminum was more readily available? I would think these days that laser or water cut stainless steel would be less expensive, and perhaps the material less expensive too? 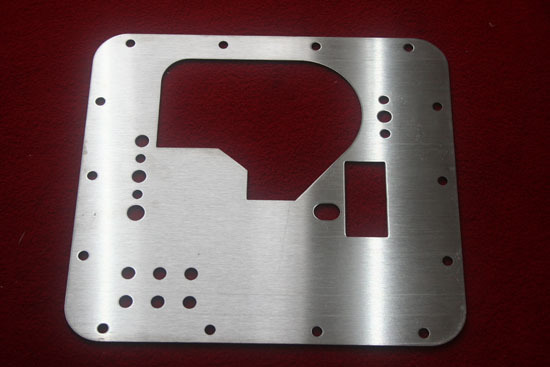 Are there any issues caused by the thickness of the aluminum plate? Would @Pete Roper be amenable to an authorized run of stainless steel versions if we could source a manufacturer? It seemed to work with the shift springs. Stainless steel would be a female dog to machine. I'd go with laser or water jet. I just happen to have a water jet source. I made one for myself a few years ago, and have the code. I would never do what Guzzibits did, but would make some with Pete's permission. I bought and resold about 50 plates from Pete. But I do not have any more available. I have also wondered about the thickness. A thinner plate would be easier to install, since it would require less modification to the sidestand bracket, which needs a hole to be enlarged for proper alignment. I've just had another run of plates done. Only got five done this time but I can up the number if required. Yes, the doppelgänger plate is an exact copy of my design and was stolen without my consent by the thieves at Gutzibits or whatever they call themselves. As I've said before, if they'd just asked me I would of said add £5 to the cost of each one and send it as a donation to Medicienes sans frontiers and it would all of been good. As it is they can go and roger themselves with a rusty star-picket. Oh, and sorry to anyone who tried to contact me about the plates. 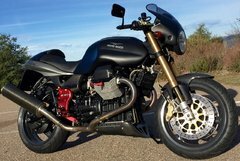 As mentioned in another thread a lot happened last year which meant I was a bit 'Under the pump', most of my work is with 8V CARC bikes nowadays and I simply didn't have the time or inclination to get more plates made. Now Michael is out of hospital and back at work, as long as my health holds together, I would be able to run up batches as required. Gulp. I had to google star picket. That would probably smart..
Who in the hell is Roger and what is a star-picket? Man, if you can't speak Amuricun at least speak English. I spoke with Pete about making them here in the U.S. under his name and sending back profit per piece. He hasn't any made, and said next batch he'd send a sample. If anyone actually has a genuine Roper plate they'd like to give up temporarily for a pattern, that would speed things along. I ain't buying one from Guzzibits. Oh hey, Pete. Your post magically appeared after I put this up. To be clear any adventure would be with Pete’s permission and a royalty would go to him or a destination of his choice. I’m just wondering if laser or water jet and stainless would be cheaper to produce. I also am not found of any modifications required by the thicker plate. If @Chuck could get a quote and it’s worth doing I bet we could easily presale enough to have a run done. I’m sure Pete would provide the CAD file to a trusted party. I also have a Norton guy in the Philippines who seems to have great manufacturing contacts at very reasonable rates. I’m thinking other techniques and materials might be significantly less expensive. Is that wishful thinking? $50 or $75 each? This week we've got a Cafe Sport in and I'm going to introduce Michael to the wonders of V11's. Damn nice bike, it's that that prompted the new run of plates as it hasn't got one. Like I said, I have the code. I could make one today, but I'm not going to unless Pete is on board 100%. Perfect, did you get quotes? I have to assume that water jetting stainless steel is less expensive than milling aluminum? Why did you originally go with aluminum and not steel? Oh Jesus, not another re-hash of that tired old photoshop turd! It makes my brain hurt. 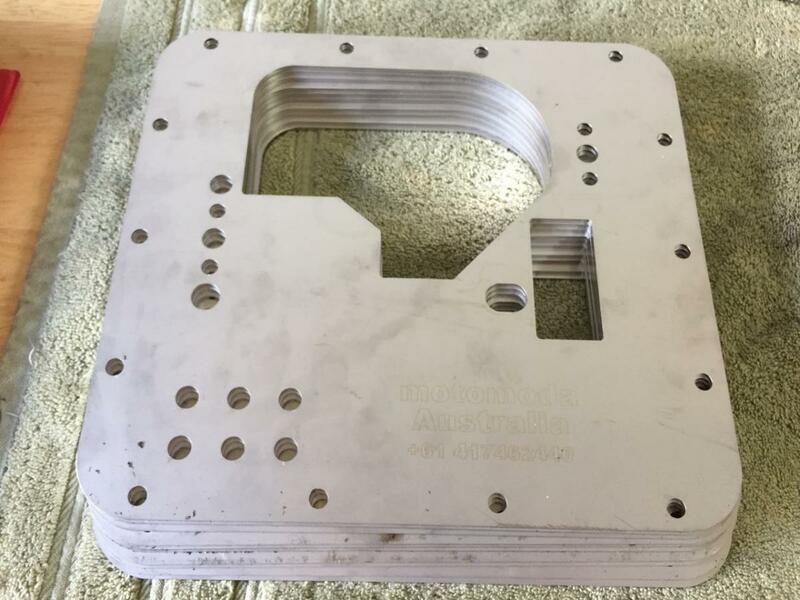 Never used aluminium for the plates as I knew from experience it would fatigue and crack. So what are your plates made from. I always assumed aluminum because at that thickness steel would be really heavy. Stainless steel and yes they are heavy, but they won't crack and fall apart! They're going in a Guzzi fer Christ's sakes a few extra ounces isn't really an issue! I guess the question is, there's low load on the plates, just oil being flung at them, right? I'm guessing you could even lighten them up with more holes. But is there any reason they couldn't be 1mm?